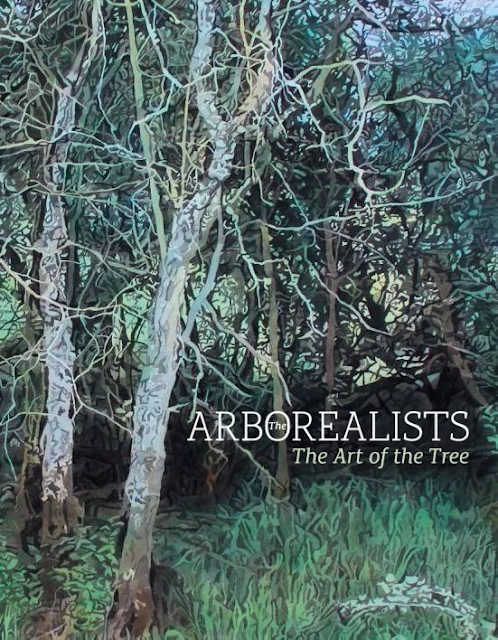 Ann Arnold exhibited with the Arborealists at The Royal West of England Academy, Bristol, in 2014 and at Mottisfont Abbey NT, Romsey, in 2015. She also showed in the seminal Under the Greenwood: Picturing the British Tree exhibition at St Barbe Museum and Art Gallery, Lymington, in 2013 – the originating exhibition for the Arborealists. Ann was a brilliant artist with an strong personal, pastoral vision and she will be sorely missed. Ann was born in Newcastle-Upon-Tyne and brought up in Surrey. She was educated at Sutton High School for Girls. Despite being beset by illness, she graduated in painting at Epsom School of Art. Also in Epsom she was introduced to the Burgh Heath Centre for the care of young people with mental illness, where a range of the arts, music, drama and especially painting were employed as therapy. At the forefront of a new profession, Ann trained to become an art therapist, working in many hospitals and she also assisted with setting-up the first degree course. Ann later founded the Association of Art Therapists. In 1961 she married the painter Graham Arnold and together they, and David Inshaw founded the Broadheath Brotherhood of artists, the forerunner of the celebrated Brotherhood of Ruralists of which she was also a member. The Brotherhood of Ruralists staged its inaugural exhibition at The Royal Academy in 1976. The seven members who included Peter Blake of Pop Art fame, proclaimed to express through personal vision and experience of their native heritage, a celebration of the English countryside. A ruralist is defined as someone who moves to the country from the city, and this was largely true of the group. The brotherhood believed that Romanticism was a neglected strand in British art, and that if re-introduced, might solve some of the problems that they believed were rife in much of contemporary painting. They looked for inspiration to the art of William Blake, Samuel Palmer and the Brotherhood of Ancients, the Pre-Raphaelite Brotherhood and to Victorian painting, design and photography in general. They profoundly disagreed with the view espoused by modern art orthodoxy that the sensibility and practice of their favourite nineteenth century artists were merely an eccentric dead-end and marginal to the progression of mainstream western art. The Ruralists’ unfashionable stance however struck a chord and with assistance from substantial media publicity (including a BBC film) and various sell-out touring exhibitions, enjoyed huge popular success. Espousing a Romantic approach to art and life, their vision is encapsulated by a John Piper quote as: of something significant beyond ordinary significance, something that for a moment seems to contain the whole world and when that moment is past carries over comment on life or experience besides the comment on appearances. In 1974 Ann and Graham moved to south west Shropshire where they acquired a steep hill of 50 acres. With the help of a tree specialist friend, they planted 6,000 trees on the hill. Ann was continuously inspired to draw and paint the surrounding landscape and she exhibited widely, at prestigious galleries throughout the UK and as far afield as Berlin and Tokyo to universal acclaim. Ann was an academician of the South West Academy of Fine and Applied Arts.